No One's World : The West, the Rising Rest, and the Coming Global Turn & Civilization: The West and the Rest present an interesting clash of perspectives. 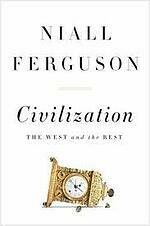 I recently heard Georgetown professor Charles Kupchan speak about his work (No One's World) and just completed reading the latter (Civilization), by Harvard professor Niall Ferguson. At the risk of oversimplifying, Kupchan argues that certain conditions existed, which allowed the West to establish commercial dominance. Those conditions no longer provide the edge which they previously did, and therefore relative status now becomes a function of conditions which simultaneously limit and support any region's or country's edge over another. During his comments recently at a WorldBoston event, he suggested that government involvement in domestic and international market participation would become increasingly desirable. While he stopped short of calling for a Chinese style controlled economy he indicated that an arrangement with many of those attributes would be appropriate in the American economical context. Ferguson takes a somewhat different approach. Starting with a similar postulation that certain conditions contributed to the acceleration of the western economies past others which had historically been far more dominant that the west, he concludes that those conditions (what he calls six 'killer apps') were a function of sociological structures. In other words, there were specific conditions which to the extent they are applicable today (perhaps, for instance, medical advancements may be less important as the general baseline is elevated) then the conditions which were favorable to economic out-performance can be fostered to create a favorable environment. And therefore the involvement of government would be to create favorable conditions, and then step back, rather than to dictate terms of commerce. I find Ferguson's position far more compelling. If he is correct (his reasoning is well documented and presented), then there are interesting implications to businesses. We speak often of the strategic imperative to identify optimal target markets - and assiduously avoid simply chasing headlines and BRICs. We advocate identifying market attributes which are fundamental to the potential success of a given product or service. Important in every analysis is the background assessment of a country's or region's likelihood for broad-based advance in incomes and lifestyle - both of which generally follow economic success and vitality. Therefore it is likely instructive to take Ferguson's "killer apps" and include them in the analysis matrix of potential markets. Additional data points reduce the likelihood of resources wasted in pursuit of unsuitable markets, and allows for allocation of those limited resources to optimal destinations. Interested in exploring which markets would be best for your products or services? Contact Consilium Global Business Advisors to learn how our international business development and export assistance programs can help you rapidly establish profitable export success.